Not many people visit Stoke Ferry these days, I suppose. The main road between Thetford and Lynn used to go through it, but now all traffic is carried past by a fast, wide bypass, and travellers hurtle along without even realising that the village is there. This is a shame, because Stoke Ferry, while hardly one of Norfolk's more attractive villages, is a most interesting place, the kind of village more common in Cambridgeshire than in Norfolk or Suffolk. Its huge growth in the 19th century was as a result of agri-industrial development, and it still retains something of this character today. Not far off are the pretty villages of Boughton, Wherrington, Wretton and Wereham, almost rural suburbs of a kind; Stoke Ferry is not pretty. The biggest employer is the Wissington sugar beet factory, and the tall chimney of a factory rather dominates the place. But even with the bypass, it still feels busy and purposeful, as if it is the centre of something, and I liked it for that. The rebuilding of All Saints dates from the period of this expansion, a time of considerable optimism in the Church of England; in retrospect, it can be seen as a time when that denomination over-stretched itself somewhat. 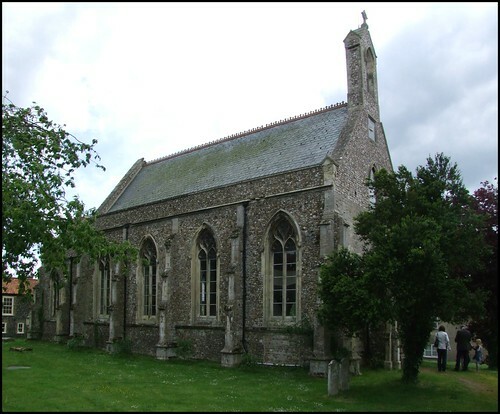 The church had been near-derelict at the start of that century: the tower had collapsed in the 1570s, and the chancel was taken down a century later. The Georgian porch and clock were added in the 1820s, but the bulk of the rebuilding was in 1848 by an architect called Donthorn. This is still early for Norfolk, thus the pre-Ecclesiological feel. There are three medieval churches within a couple of miles, as well as another Victorian one, and so today All Saints is redundant. It is in private ownership, but it is used regularly by the local community for exhibitions, concerts and other functions. We arrived in Stoke Ferry to find that there was an art exhibition on, the cleared nave full of display boards. I think the nice lady on the door knew straight away that we weren't there for the pictures, but she didn't seem to mind, and was very welcoming. And so we wandered around this small, crisp church. The nave is full of light, the windows large and the tracery in a flamboyante style. Flamboyante, literally 'blazing flame', was what the French had when we had Perpendicular, and it was popular with Gothick architects of the early 19th Century. The pale coloured glass in an Art Nouveau style in the upper lights must be later. Interestingly, Pevsener says that these patterns were also to be found on the font, but this is now gone. The other striking feature of the nave is the set of painted shields decorated with heraldic devices. The chancel is slightly surreal. Although the part of the church which is most recognisably church-like, the priest door has been replaced with a cinema-style emergency exit door, with toilets beyond. The east window is filled with good glass from a Norwich workshop, the side windows with rather more workaday Saints by Heaton, Butler & Bayne. The church must have been given a serious going over in the 1860s as well. Turning west, the area above the entrance is filled with a good mezzanine gallery. I am told that the radio personality Kit Hesketh-Harvey, the good-hearted owner of this church, uses it as his office.